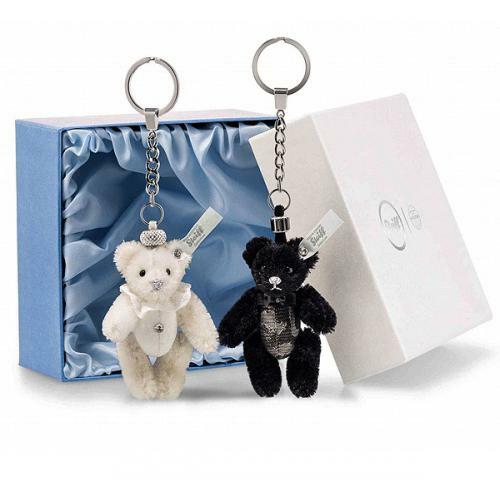 Wedding Pendant Teddy Bear Set is from the Steiff special Selection range and is made in beautiful black and white mohair. This wonderful Steiff set, is a white Selection tag edition and wears the famous Crystal Button in Ear. 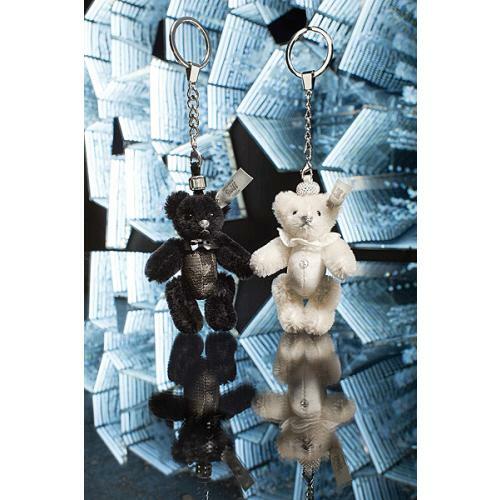 These 9 cm Teddy bear pendants are made of the finest mohair. In white: the bride - with a white patterned body adorned with a crystal from Swarovski. A collar is made of the finest lace and a silver thread runs through the nose and mouth. In black: the bridegroom with a black patterned body. The bow tie around its neck is decorated with a luxurious crystal from Swarovski. A silver thread runs through the nose and mouth. Besides the use of the best materials that went into its making, the Teddy bears can sit and stand beautifully since they have five joints and their heads, arms and legs are moveable.The two Teddy bears have a lucky charm hanging from the bottom of the pendant chain. This flexible accessory can be used as a pendant for your own necklace or a bracelet. This unique Teddy bear set is supplied in the illustrated gift box.